Ducks, Cold, Food & a New Store! Food & Drink > Ducks, Cold, Food & a New Store! Another cold day in Fort Lauderdale---okay, okay 68 degrees is not cold compared what it is happening up north but still I wore long pants today!! A new store opened about a month ago and I haven't been in it. I got the feeling it was like Whole Foods, very expensive and too 'healthy. In any case, I had some time today so I went over there. It had been 4 restaurants there in the past 20 years and I had been to 3 of them. This new company, called Wild Fork Foods, have completely done the building over. It is a world of protein including beef, lamb, veal, sausage, chicken, shrimp, fish of all kind and more. They had something that sort of resembled a Prime Rib with a bone that was at least 20 inches long and 6 ounces, maybe, of what looked like a sirloin. It was only $32 a pound!! After spending an hour looking around--I love looking at food--I decided to leave and there right in the front, getting ready to walk by the front door, was this family of ducks. Heck with the cold, didn't they know that Wild Fork Foods sells high priced duck parts and they were now becoming the 'latest' need to have meals in South Florida? 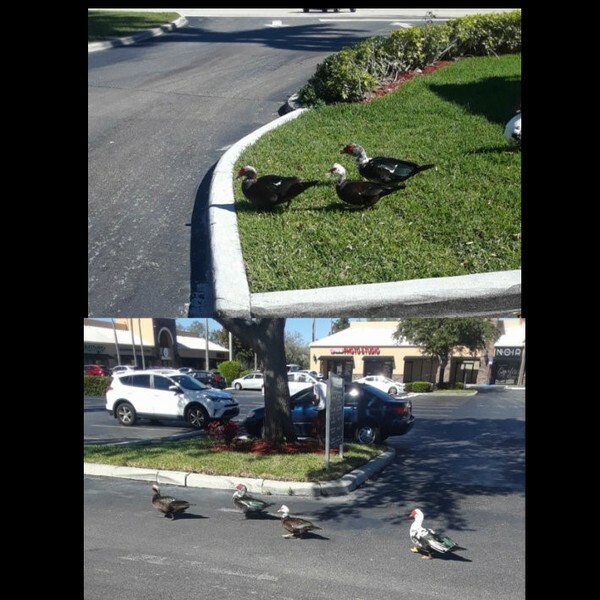 They just walked across the shopping center as if they owned it! You can post multiple pictures: upload the one, copy/paste the code to your post. Click Finished and start again. I know that--about the pictures! The cold must be affecting my mind--still in the 60s here--that's like 5 below in Colorado! !